There are some items that hold a permanent spot in my refrigerator. Hot sauce, mustard, mayonnaise, jam, eggs, milk...you know, the typical stuff. Something that's perhaps not so typical is an assortment of pickles. I usually have regular pickles on hand, but I also make pickled onions and (occasionally) pickled carrots and radishes. I know that pickles can be quite polarizing in the food world. Like cilantro, the people I've encountered throughout my life usually love it or hate it. For the most part, I get it. The exception being pickled onions; who in their right mind doesn't like pickled onions? It goes on everything: tacos, sandwiches, rice, eggs, meat, fish, everything. They are also absurdly easy to make. All you do is slice some onions, make a pickling liquid, and pour it over. If you're planning on canning/preserving pickles, that's a different story. I tried canning a large batch of pickles once (where you have to boil your jars in a waterbath) and it was such a huge pain that I've never done it again. In the days of modern refrigeration and year-long produce, I find it unnecessary as I usually finish my pickles within the month then make another jar when needed. 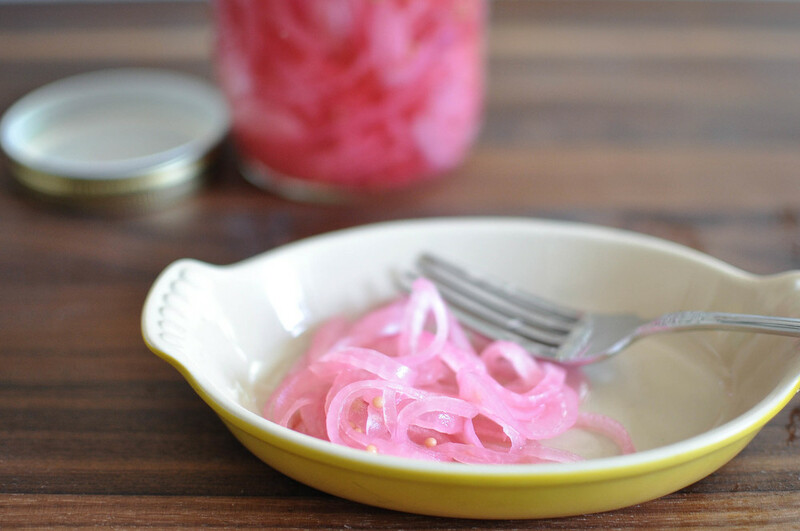 Pickled onions can keep in the fridge for a few weeks. When the color turns from a vibrant pink/magenta to a dull purple-y grey, it's time to toss them. But hopefully, you will never get to that point. Yields a 24 oz jar's worth. Peel and slice onion in half. Slice each half as thinly as possible. Transfer to a 24 oz jar. Place vinegar, water, sugar, peppercorns, mustard seeds, bay leaf, chili peppers if using, and salt in a small saucepan. Bring to a boil, turn heat to low, and simmer for 1 to 2 minutes until sugar has completely dissolved. Turn off heat and pour over onions. Close jar and let cool to room temperature. Place in fridge for at least an hour before using.